The later attached lip and ‘suspended’ (neutral buoyancy) weighting have allowed the Terrif DC12 to trace just below the water’s surface at various retrieval speeds. In addition, the lure tends to rise closer to the surface after turning, which is often where fish bite the most. One can also perform a side-to-side sliding action with some technical rod work. 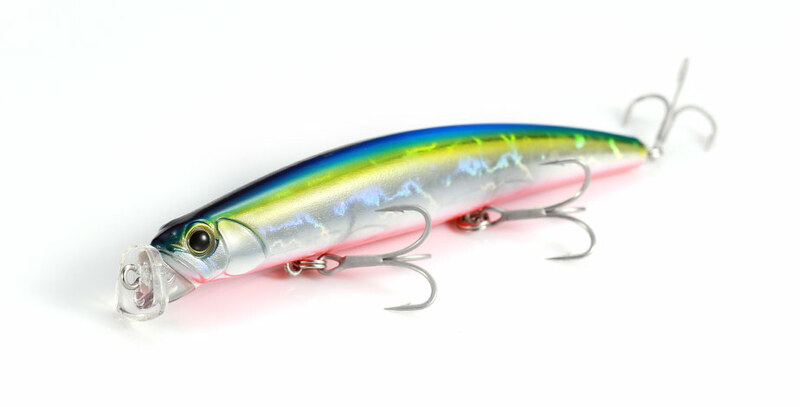 This replicates bait-fish on the run and can produce many bites for anglers. Ordinary minnows and lipless minnows tend to dive too deep and jump out of the surface, respectively, when there is a strong current against the lure. The angler will quickly appreciate this lure’s potential in the strong currents and during fast retrieval. The DC12 is a lure that can trace at a specific depth without regard to retrieval speed or current strength. The DC12 was designed with the “down cross” performance in mind, so it is able to handle somewhat rough waters without jumping out, and precisely trace at a shallow range. It is not only great over shoaling beaches, but also in shallow boulder areas. 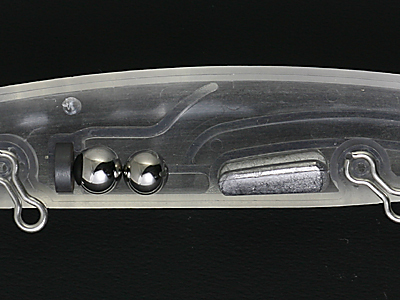 A 6.0 mm and a 5.6 mm steel ball are used as the moving weights; they are held in place by a magnet once the lure is swimming. To further increase weight, there is also a shaped fixed weight in the belly section.